Strength is a language Vladimir Putin understands. The sanctions first imposed by Western powers in the wake of the Ukrainian crisis hit the vulnerable Russian economy hard. That seemed to give the Russian president pause, at least for a while. He remained remarkably silent when newly elected Ukrainian President Petro Poroshenko sent his army to clamp down on Russian separatists in the east of the country. But the United States and Europe now say Russia has resumed supporting its allies in Ukraine with combatants and weapons. The time for sanctions has returned. Washington has struck first, with a new, tougher round of measures against some of Russia’s top banks, oil and gas companies, and arms manufacturers. The European Union is preparing to strengthen its own sanctions package in a couple of weeks. It will be weaker than America’s, if only because European economies are more exposed to Russia. If EU leaders understand that robust action does work, they will send a firm message to both Vladimir Putin and Western investors: it won’t be business as usual as long as Moscow keeps stirring trouble on its neighbour’s territory. The new U.S. measures aim at the heart of the Russian system in a way that will strike a chord in the Kremlin. Those targeted include Rosneft, the country’s largest oil group whose chief Igor Sechin, a close Putin ally, had already been personally targeted by the last round of sanctions; and Gazprombank, a lender headed by Putin’s former KGB colleague Andrey Akimov. The latter is also a director of gas company Novatek – itself on the sanctions list. Russia could live with a short-term markets fall. The MICEX stock index fell 2.4 percent on July 17 but was still 15 percent above the mid-March trough it sank to in the heat of the Crimea crisis. The rouble fell 1 percent, but the central bank of Russia knows how to manage the currency, and the country’s deep-seated economic problems are a greater concern. What Russia couldn’t live with for long is a permanent state of uncertainty for investors both foreign and domestic – the former keeping out, the latter getting out. Vladimir Putin knows he can avoid this by offering a simple olive branch. 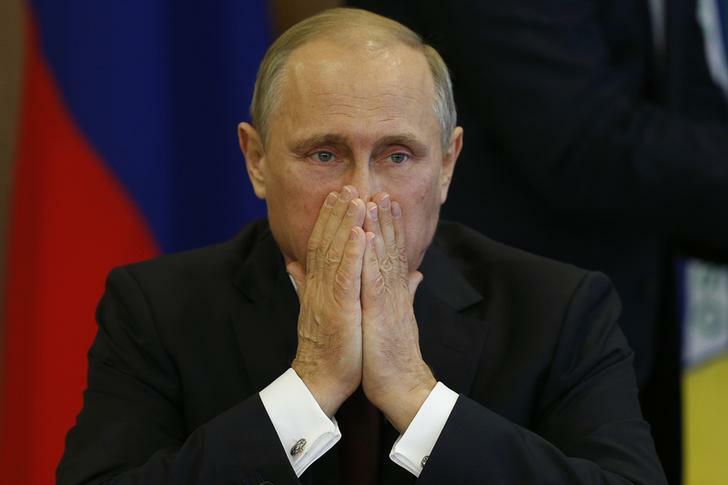 Russia's President Vladimir Putin reacts during a ceremony with Brazil's President Dilma Rousseff (not pictured) at the Planalto Palace in Brasilia, July 14, 2014. The U.S. government on July 16 imposed sanctions for the first time on some of Russia’s biggest firms over Moscow’s failure to curb violence in Ukraine. The MICEX stock index fell 2.4 percent on the news on July 17, with target companies’ shares among the top decliners. The shares of oil company Rosneft were down 4.4 percent, and gas producer Novatek fell 5.2 percent. The sanctions in effect close the firms to medium- and long-term dollar funding. Other targets include Vnesheconombank, VEB, which acts as payment agent for the government, and eight arms firms, including the producer of the Kalashnikov assault rifle. EU leaders decided the same day to expand their sanctions against Russia to target companies that undermine Ukrainian sovereignty, and said they would ask the European Investment Bank, and the European Bank for Reconstruction and Development, to suspend new lending to Moscow.